Farrakhan should not have been surprised nor upset by the Jewish reaction to his anti-Jewish comments, since he himself advocated the use of economic pressure to defend one's community. The Minister added that it was right for the black community to fight the Jews with whatever economic influence they had because it was in their self-interest. Asked, "Do you not agree that Jews likewise should use any economic influence that they have to protect their interests as well?" Farrakhan smiled and said, "Certainly...Each of us as a people have a right to use whatever we have at our disposal to protect our interests. But," he qualified, "if those interests lie in...robbing others of that precious right that is given by God...keeping us suppressed and oppressed, then that's not legitimate." 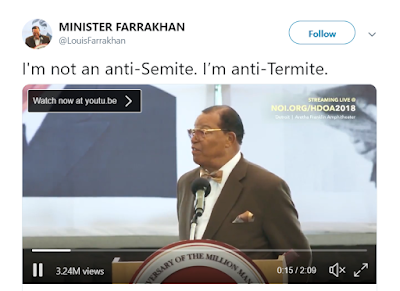 But Farrakhan didn't see it that way, and rather than take responsibility for the chilling effect of his own Antisemitism, doubled down on the excuse that Jews were out to get blacks.